We were treated to a fabulous assembly on Friday by Miss Hubbard and 3H on the topic of living together and being part of a community. The children explained that a community is a group of people who live together, who have unique qualities. The children worked to identify what is essential for a good community and drew their own maps to show this. In Art the children designed their country flags to share the countries that represent 3H. They shared information about their home countries and found out new and interesting things. One of the significant parts of the assembly was when the children said that ‘Even though we are from different countries, we are still a part of the South Grove community and that is to achieve success and be the very best that we can be.’ This is very much part of the school’s ethos. 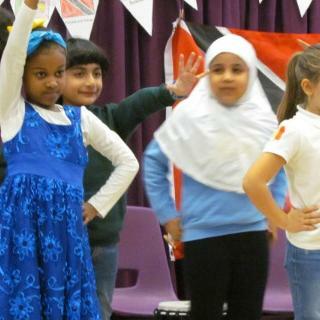 As part of Geography the children had to compare the community life in Great Britain to Trinidad and Tobago. The weather, food and dances were all compared. They also compared different music and dance styles. The dances were great! The children shared their educational visit photographs where they visited a very different sort of community at London Zoo. What a fabulous day they had! As part of the children’s home learning Research Project they were given the task of designing their very own family trees. The children shared these with us. They were absolutely fabulous! Thank you to all the parents who supported their children to make these. My thanks go to Ms Hubbard for planning the assembly and with great support from Miss Mairead, Miss Kotecha and Miss Mitchell.